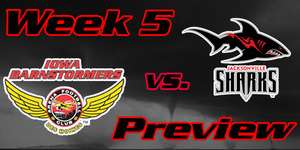 The Barnstormers posted their second victory of the season last week on the road against the San Jose Sabercats. Although the Barnstormers allowed a Sabercat touchdown in the first minute of the game they quickly retaliated with back-to-back touchdowns, putting them ahead 13-7. What seemed to be more like a tennis match for scoring, the Sabercats scored yet again to take the lead but neither team showed signs of quitting. With the Stormers still struggling to make their PATs, they decided to run a 2-point conversion midway through the second to put themselves up 27-21. The Stormers and the Sabercats battled it out neck and neck up until half time, heading into the locker room tied 34-34. More back and forth play continued throughout the third quarter as the two teams entered the final 15:00 minutes of the game tied 48-48. An interception at the halfway mark by Iowa Defensive Back Chris Felder finally changed the momentum of the game in favor of the Barnstormers. Although the Sabers tried to climb back, they were no match for the strength of the Stormers’ defense as Iowa came out on top with a 76-69 victory. The Iowa Barnstormers (2-1) face off this week against the Kansas City Command (0-3) in their first conference match up of the 2011 season. Formerly the Kansas City Brigade, the Command will be hosting this game as their first home game of the season and in franchise history. Although the Command is currently ranked last in the National Conference, Central Division, they have yet to play on their own turf and will bring to the field a team of unyielding players who will put up a fight against any opponent. The Kansas City Command took on the Spokane Shock last week in their third straight game on the road, losing 61-34. It marked the first victory this season for the defending Arena Bowl Champions as they conquered the Command by 27 points. Command’s Quarterback JJ Raterink, attempted to lift the team to victory posting 304 passing yards for the game and rushing for three touchdowns, however his efforts were unsuccessful and the Command walked away with their third defeat of the season. Iowa Barnstormers vs. Kansas City Command will be broadcast LIVE on 1700 AM The Champ, on the Internet at www.theiowabarnstormers.com and at www.nifty-tv.com. -This is will be the first meeting between the Kansas City Command and the Iowa Barnstormers in franchise history. Felder demonstrated impeccable strength and stamina on the defensive side for the Barnstormers last week against the San Jose Sabercats, earning himself the honor of Ironman of the Game. Midway through the fourth quarter Felder intercepted a pass and returned it for three yards, changing the pace of the game. Only a few possessions later, he forced a fumble, rattling the Sabercats to only a four play drive. Felder also tallied 6.5 tackles for the game.